I plan on coming to the soundtrack album for Pat Garrett and Billy the Kid tomorrow after a few more listens (it’s super short), and then likely the film itself (which I have never seen!) on Tuesday. 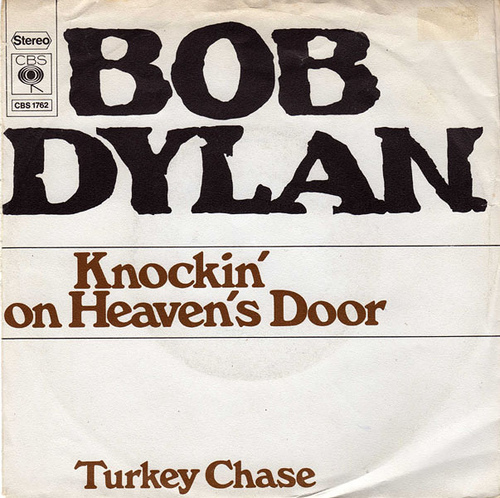 I thought that I’d kick off 1973 with Dylan’s first single from that year: “Knockin’ On Heaven’s Door”. Dylan wrote this tune as an additional song for Sam Peckinpah’s film (in which he has a small part). Dylan wasn’t much used to writing for soundtracks, and Peckinpah apparently didn’t care much for the song – he left it out of the first cut of the film. When Peckinpah lost control of the editing of the film to the studio, who reportedly butchered it, the song was put back in, and it was one of the only things that anybody liked about it. Kris Kristofferson, who starred in the film, thought it was one of the best songs ever written for any movie, but noted that Peckinpah had a blind spot in that regard. Obviously the song went on to be legendary. It’s been covered by just about everyone from Guns ’n Roses to Avril Lavigne. The Grateful Dead used it as a show closer for about a decade in the late-1980s and early-1990s, while Dylan himself has played it live 460 times. It appears on an astonishing five of his live albums. Virtually everyone plays it the same way – as a dour drone. Eric Clapton did a reggae-inspired version, which is certainly the most unusual. It is one of the simplest songs that Dylan ever wrote – two short verses and a one line (repeated) chorus. It’s a maudlin, fixin’ to die song, but it is a really good one. It’s sad without actually being that sad, if you know what I mean. Sort of an accidental classic, and the best new song Dylan has produced in a number of years at this point in time. One thing that strikes me as somewhat hilarious is that the song was packaged as a single with a B-side of “Turkey Chase”, which is just about the least notable song on the entire soundtrack. I suppose that had they gone with “Billy”, the only other song from the album with vocals, it probably would have negated the need to buy the album at all. Here’s the Clapton. I can’t bring myself to link to GNR.